George Hardy has very little written about him; there’s not even a Wiki piece on the internet (as of 2 February 2013). He doesn’t even seem to get a mention on Arsenal’s own web site. So, time to put that right – not just for completeness but because the George Hardy story is a story of huge interest – here is a piece. As so often with the Norris era I am particularly indebted to Sally Davis for her work on this topic – work that far exceeds the sparse commentaries elsewhere. This is how Sally Davis reports the arrival of Hardy at Arsenal. It is in fact the only report of his arrival I can find. Sally Davis makes the point that Hardy was therefore a “Norris man”, something that proves to be of considerable importance later. The first stories we have of Hardy focus on the early days at Highbury. 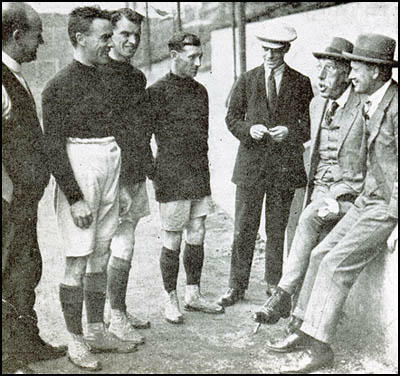 In the first game at Highbury (September 6, 1913) , George Jobey, Arsenal’s new centre forward, scored but then injured an ankle. In this tale Jobey was carried off by George Hardy. Since the dressing-rooms had not been built yet, Jobey was taken to his home for treatment. The story is that George Hardy borrowed a cart from the local milkman to take him there. Another version has him putting Hardy in a wheelbarrow. The other story concerns Robert Benson who joined from Sheffield United in 1913. He left football when it was suspended in 1915 and became a munitions worker. But like many others he put in occasional stints in wartime league games and friendly matches. In a game against Reading he was suddenly asked to play, although he had not been training. He had to leave the pitch before the end feeling unwell, collapsed and died “in the arms of the Arsenal trainer, George Hardy,” as most reports put it. In 1927/28 there is a suggestion that George Hardy had a benefit match – a game against Corinthians, and most reports suggest 1927 was the year when the relationship between Hardy and Chapman exploded. If there was a benefit match it would have been arranged by Norris, not Chapman, as we’ll see below. On 2nd February 1927, Arsenal played in an FA Cup 4th round replay against Port Vale having drawn 2-2 four days earlier. According to Tom Whittaker (and remember Whittaker was hardly an unbiased observer in all that followed), “Arsenal were pressing hard, but things were not going just right and old George Hardy’s eyes spotted something he felt could be corrected to help the attack. During the next lull in the game he hopped to the touchline, and cupping his hands, yelled out that one of the forwards was to play a little farther upfield.” Chapman was furious and sent Hardy to the dressing-room. (Arsenal won 1-0 and went on to the Cup Final for the first time that season). But this raises the question: why was Hardy so strongly disciplined for one misdemeanour? Sally Davis suggests that the event brought into the open something that had been simmering for some time: who ran Arsenal. Davis says that “William Hall was called on to exercise his authority as a director to bring the row to an end; he chose to allow Chapman to deal with Hardy as he saw fit. This is important because in 1925 when Chapman was first appointed, Davis says that Chapman wanted to demote or remove Hardy, whose methods he considered dated. Sir Henry would not allow it. So allowing Chapman to decide the issue was a direct challenge to Sir Henry. According to Davis, Sir Henry “Norris, however , told Chapman that he had exceeded his authority in making this change of personnel. He was angry that it had happened to Hardy, obviously [as Hardy was seen as a Norris man – and symbolically was the first Norris appointment], and his view was that only the club’s directors had the authority to hire, raise up and cast down,” which of course was true. There had not been this sort of argument before – but on the other hand no one had told Chapman how to behave before, save at the very start of his appointment when the argument broke out over the same issue: Hardy. Sir Henry had told Hall to go to Chapman but Hall had felt he was being turned into a messenger boy and resigned from the board of directors. Sir Henry was now in an exposed position. In this version of events, Hardy was not sacked at all, but subsequently left of his own volition and thus the episode ended without Norris directly coming in to reinstate him and do what he had not done before: override Chapman. So Whittaker continued to be the first-team trainer as Chapman wanted, and Chapman’s authority was never again questioned. But whichever way it happened Hardy left in 1927 to work at Tottenham, before moving on to coach Tottenham’s nursery side Northfleet United. This version says he died preparing for a Tottenham match v West Bromwich Albion in January 1947. So there we are – the first article on George Hardy which pulls together the different strands of opinion. There are of course many gaps – if you know any more please do write in. Am trying establish who the Joe Irvine is in the picture – any ideas? The spelling of the name of the original caption was wrong. It is Joe Irving. He was born in 1898 in Hobson, County Durham. He was an amateur with Langley Park before being signed by Preston in 1921. He played 15 league games and 1 FA Cup game for Preston during 1921-22 before joining The Arsenal in July 1923. He played in the team that won the London FA Challenge Cup in in 1923-24 and the experimental offside friendly game against Chelsea in January 1925. Other than those two first team games he spent his two seasons at The Arsenal in the reserves. During the summer of 1925 he joined Aberdare Athletic where he played 8 games in Division Three (South) and 2 FA Cup ties. After that, I haven’t got any more information. Joey Irving was my Grandfather. After Aberdare, he also played for Peterborough. He ended his playing career with Grays Atlectic FC and then as player/coach for a couple of local works teams. He died in the late ’60s. We still have his Arsenal medals and a programme, plus a few photo graphs from his playing career. John, thank you so much for getting in touch and giving us extra info. George Conyers Hardy was married to my Maternal Grandmothers older Sister Elizabeth Brown, they married in Newcastle upon Tyne June 1901. My Mother told me about George many years ago and it is only recently I’ve searched and found information on him, the article above included. Its a shame my Mother wasn’t able to learn further of George’s life in Football as she died 2005, however other members of our family have found his details very interesting so I thank you for the above, being from the Northeast football has featured widely in the family albeit mainly supporting Newcastle United, however myself and two of my Brothers were Gunners in the Royal Artillery so have also held an interest in the achievements of Arsenal FC, ‘Up the Gunners’. Frank, so much for getting in touch. I think there are some other references to George Hardy on the site – just put Hardy in the search box and you’ll find them. Hope they are of interest. George Conyers Hardy was my maternal great grandfather. It may be that my mother, his grandaughter, is happy to share more details with you if you would like me to ask for you. All information is most certainly welcome.